The original Monster Slugathon from Avalon Hill Games! 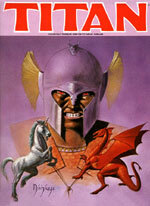 Players take the role of a Titan, a powerful warlord who summons armies of fantastic creatures. There is a strategic element to the game, where stacks of armies wander a fictional world seeking advantageous positioning, and then a tactical phase, where two enemy armies collide and fight! Eliminate all other Titans and claim victory!